Isagenix IsaBody Challenge – Get Fit & Healthy and Win HUGE Prizes! If you’ve spent time getting to know Isagenix and its global mission, you know that it is a company committed to supporting its customers in new and exciting ways. With that kind of customer and employee focus in mind, it’s no surprise that Isagenix offers a unique and exciting opportunity to encourage your fitness goals. 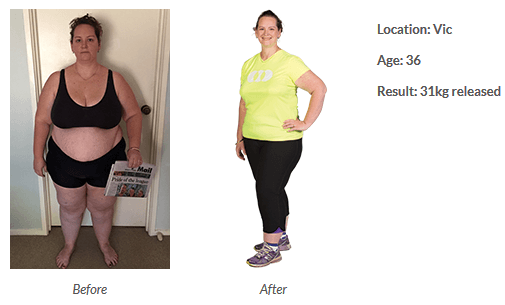 The IsaBody Challenge is a generous, multi-faceted competition that encourages all Isagenix users to make greater strides towards physical achievement. It’s free to join, you can win $1000s worth of cash and prizes, and everyone that completes it receives a $200 Isagenix voucher for FREE! The IsaBody Challenge is a 16-week competition that is designed to help Isagenix Associates and Preferred Customers reach monumental fitness goals. The competition operates year-round, so new participants don’t have to worry about waiting to sign up for a new period. Once you’ve found the motivation, you’re ready to get started! The Isagenix IsaBody Competition is centered on creating a compelling story of your fitness progress. At the beginning of the challenge, you snap a few ‘before’ pictures for comparison. At the end, you take similar ‘after’ pictures to show your progress. Throughout the competition, you must use at least 500BV of Isagenix products to support your fitness goals. Contestants then write a 250-500 words narrative to pair with their images, describing how the Isagenix program benefited them. The most inspiring stories with the best results are eligible for incredible rewards! The IsaBody Challenge requires no joining fee for Isagenix Associates. If you’re not currently an Isagenix Associate, contact IsaTonic and we can get you started. While there is no monetary requirement, you will have to push yourself mentally, emotionally, and physically. Previous IsaBody Challenge contestants have achieved goals ranging from incredible weight loss (10-40 kg in some instances) to rejuvenated physical fitness to impressive athletic accomplishments. Weight Loss: This category is relatively self-explanatory, as the contestants who post the most impressive weight loss results are awarded with enticing prizes. However, it is not always the contestant with the most substantial weight loss who wins; a compelling story about your weight loss achievement could help to push your entry over the top! Energy & Performance: If weight loss isn’t necessarily your focus, you may aim for athletic goals that would fall under the Energy & Performance category. Previous winners have completed fitness events like marathons and triathlons, or cut down their body fat percentage as a result of increased exercise. Healthy Ageing: Isagenix products and programs are safe for people of all ages and fitness backgrounds, and the Healthy Ageing category is targeted specifically to those contestants who are seeking to age gracefully with a healthy lifestyle. These stories are often the most impressive – contestants who have struggled with fitness their whole lives find that they’ve turned it around with the IsaBody Challenge! Reload: This category is devoted exclusively to contestants who have already completed one Isagenix IsaBody Competition. There is no limit to the number of challenges that you can complete, and the Reload category rewards those contestants who have sustained and increased their progress over the course of multiple IsaBody Challenges. A Wide Variety of Prizes Up for Grabs! The best part about the IsaBody Challenge? If you finish, you receive a prize! And this isn’t just a lame “certificate of participation” – if you complete the IsaBody Challenge, you’ll receive a FREE voucher for $200 of Isagenix products! Where else can you get something for nothing? Prize values increase as your story gains more acclaim. If you are awarded with an Honourable Mention, you’ll receive a voucher for $500 of Isagenix products. That’s more than enough to keep you going towards your goals. Challenge Round Finalists receive a collection of prizes including $3,000 AUD, a professional photo shoot, and transportation/accommodation for the National Isagenix Celebration and Judging Event. Free money and a free vacation? What more could you want! It gets even better for the Grand Prize Winner – your prize money increases from $3,000AUD to $10,000AUD, and your Isagenix Celebration occurs in the United States! The Grand Prize Winner of each IsaBody Challenge is honoured on-stage with a presentation and trophy. 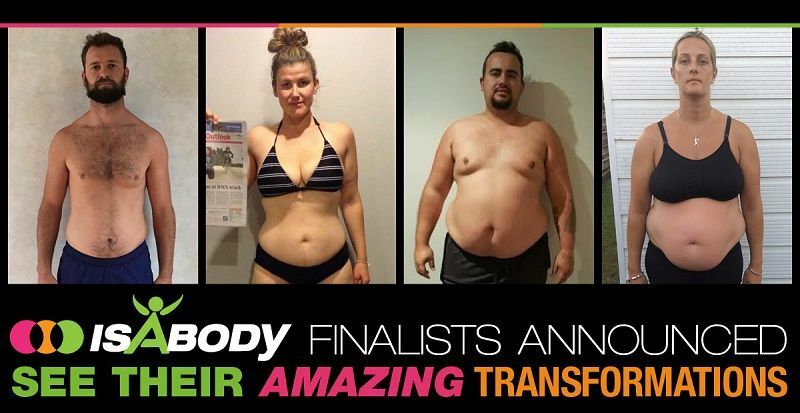 Isagenix have just announced the latest round of IsaBody winners. Click here to see their amazing transformations! Damien – At 167kg, Damien felt unhealthy, unfit and unattractive. 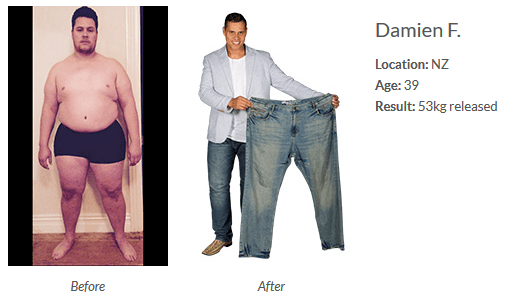 With the help of Isagenix and a new exercise regime, Damien lost an amazing 53kg! What are you waiting for? Sign up now to complete your first Isagenix IsaBody Challenge. We can’t wait to read about your success! Simply click on the button below, select your country, and then click on ‘Sign Up and Save’. You can select your first pack during checkout. Alternatively, use the contact form below and we’ll be in touch with our recommendations based on your weight loss or fitness goals. ** Weight loss should not be considered typical. 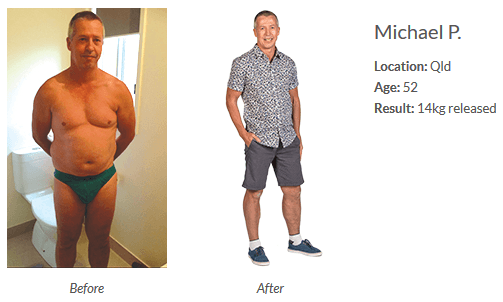 In a study performed in 2012 by University of Illinois at Chicago researchers, subjects lost an average of 4.1kg with an average of 0.9kg of the loss from visceral fat after 30 days on an Isagenix Program. The subjects also had a greater level of adherence and had more consistent weight loss from week to week compared to subjects on a traditional diet. Always consult your physician before making any dietary changes or starting any nutrition, weight control or exercise program.